Adria Gross, FIPC, president of MedWise Insurance Advocacy, has been on both sides—make that three sides—of the health insurance fence. She was a long-time epilepsy sufferer in her youth and had a long career working for a major insurance carrier, responsible for vetting and very often denying claims. Now she is a medical insurance advocate for patients who are fighting for the medical insurance coverage and reimbursements they are entitled to. She also co-authored “Solved! Curing Your Medical Insurance Problems” with Douglas Winslow Cooper, Ph.D.; the book was released on Amazon last September and has now been accepted on the Jewish Book Council’s list of must-reads. 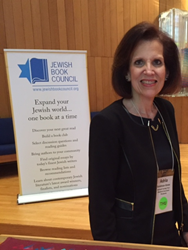 As an author on the Jewish Book Council website, Gross is also a member of the organization’s speakers bureau. She will speak next year at the Jewish Federation of Orange County in New York and at the Jewish Community Center in Bridgewater, N.J., and is discussing other possible speaking engagements on both the East Coast and West Coast. All proceeds from the sale of books at these engagements will be donated to the non-profit organizations. In addition to synagogues, Jewish organizations and other non-profits, Gross is also available to speak to corporate heads and company employees about how to tackle insurance claim issues and alleviate surprise charges or overcharges by healthcare facilities and providers. Since founding MedWise Insurance Advocacy in 2012, Gross has helped clients recoup millions of dollars of previously unreimbursed claims from insurance companies as well as from corrected, reduced charges from medical practitioners and facilities. She wrote her book in order to share her expertise with a wider audience, and arm patients with the knowledge they need to fight unfair claim denials. “Solved! Curing Your Medical Insurance Problems” offers helpful insights into how patients can spot overcharges by medical providers and underpayments or incorrect denials by their health insurers. It is filled with tips on how to reduce the odds that a health insurance claim will be rejected, and how to handle a rejection, and provides the knowledge that lay people need to successfully manage an erroneous billing situation or to appeal an unfavorable insurance reimbursement decision. As a nationwide medical insurance advocate, MedWise Insurance Advocacy in Monroe, New York supports individuals and their families, and elder law and personal injury attorneys on medical claim matters, from resolving medical bills and denied health insurance claims to handling medical lien claims and medical letters of appeal. Founded by Adria Gross, a New York State-licensed insurance broker and consultant , and certified medical billing, coding and claims consultant, MedWise Insurance Advocacy is a division of MedWise Billing, Inc., a medical billing and credentialing practice. Gross uses her expertise to uncover discrepancies in diagnostic or procedure coding, or discover the loopholes through which insurance companies are attempting to deny a claim, as part of her practice. Gross has 25 years of experience in the insurance field and holds the Federal Insurance Professionals Certification (FIPC); she has helped clients recoup hundreds of thousands of dollars in unreimbursed medical expenses or reduced clients’ medical bills since starting her company in 2012.